Just south of West Seattle. Just minutes from Sea-Tac or Downtown Seattle in the White Center area. 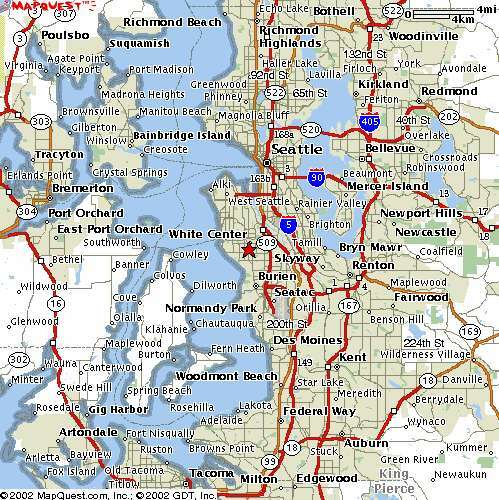 From I-5, take exit 154 to Burien / SEA-TAC Airport. Follow hwy 518 to end , it becomes S 148th, continue straight on 148th for 3/4 mile and turn right on Ambaum BLVD SW. Follow for 2 miles(Ambaum will become 16th ave SW) to 107th(taco-bell on corner), turn right on 107th, turn left on the next street ,15th Ave SW(Shell gas station on corner) and go down to 2nd block. Campbell's Auto Sales will be on your right. Click on map for to zoom in or out.